Sunlight is a fascinating phenomenon. We experience it everyday, we rely upon it everyday. Without it life on earth would cease to exist. In addition to the very familiar ways we already benefit, sunlight also brings us solar power. 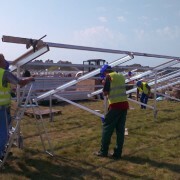 Solar power is generally defined as the conversion of energy from sunlight into usable electrical power. It includes indirect technologies such as concentrated solar power (CSP) as well as direct technologies such as photovoltaics (PV). 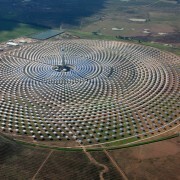 CSP systems require a great deal of land to be efficient. As a result, you’re probably not likely going to see a CSP system installed in your neighborhood anytime soon. Unless you live in the desert. PV systems, on the other hand, are typically utilized on residential or small commercial applications. 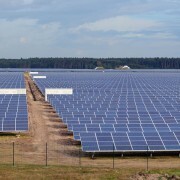 They can be efficiently scaled down to an individual’s needs or can be scaled up to meet the needs of very large utilities, such as Germany’s Neuhardenberg Solar Park, mentioned here in a recent blog. Solar Power Technologies – Is the Future already here? As the needs of a growing economy evolve and concerns around green house gases continue to increase, its important for consumers to be informed about all the various alternative forms of sustainable energy. 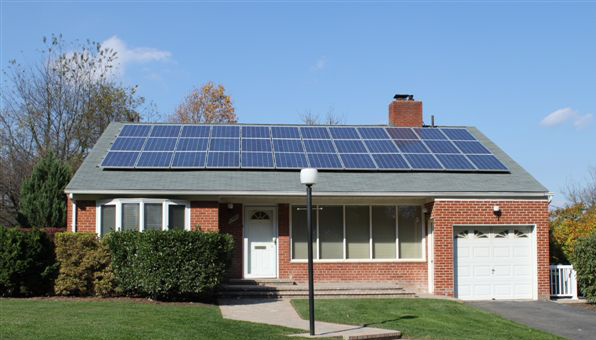 Photovoltaic electrical systems are appropriate for a homeowner seeking to make a lifestyle change. A decision to outfit your home with solar panels or solar shingles (a photovoltaic system) reduces your dependence on the electrical grid. Most large scale electrical grids in America are still powered by fossil fuels. A home powered by PV technology is a home that is committed to reducing pollution and green house gases. 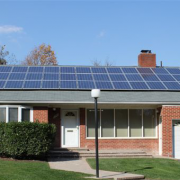 For more information on the basics of a solar panel system, read our previous blog. Concentrated Solar Panels (CSP) also utilize energy from sunlight, but in a vastly different fashion. CSP systems use reflective mirrors to focus the sunlight towards a liquid medium. Energy is transferred by heating the liquid to extremely high levels. The liquid is channeled to a chamber where water is boiled and the resulting steam drives a turbine. A few competing implementations of CSP technologies are competing in the marketplace. 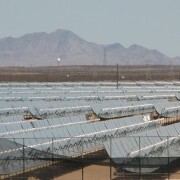 The first successful large-scale implementation of CSP utilized parabolic panels (pictured at right) to concentrate sunlight to a tube filled with synthetic oil. The resulting light energy is up to 80 times more intense than ordinary sunlight. Synthetic oil is used because it can transfer heat up to 750°F without dramatic changes in pressure. The parabolic CSP systems designed during the 1980’s and 1990’s and used to a great deal in California’s Mohave Desert are not sufficiently efficient to run independent of any other energy source. At night or during periods of extended lack of sunlight, they cannot support the electrical demands for its consumers. 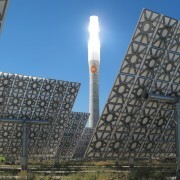 Pictured at the top of this blog and to the right, is the Spain’s new Gemasolar Plant. 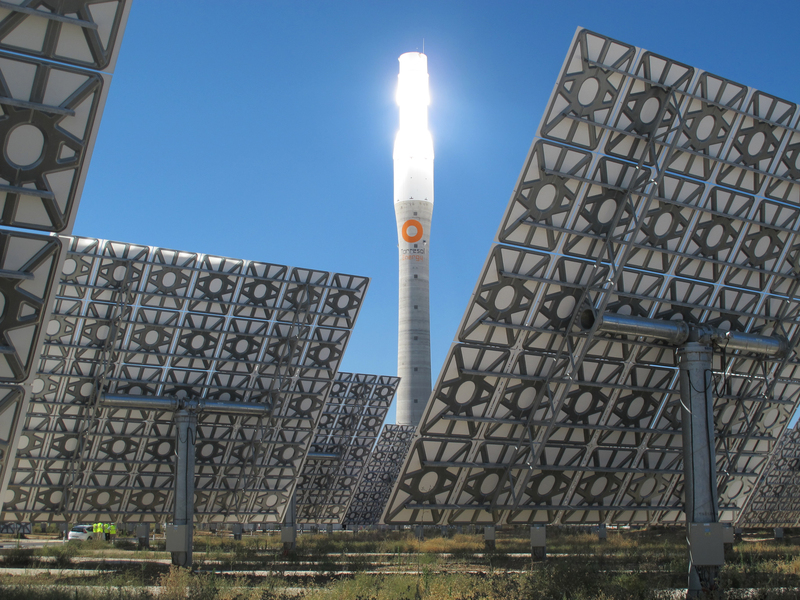 Heliostat reflectors direct sunlight to a centrally-located, molten salt-filled tower. The molten salts are circulated into underground, highly insulated tanks where steam driven turbines run around the clock. The stored heat can push the turbines at full capacity for up to 15 hours without additional sunlight. The third quarter of 2013, the most recent data available, was the second largest solar installation quarter on record in America. A 35% increase over the third quarter of 2012 was achieved with 930 MW installed. The residential segment saw 186 MW come online. The falling costs of panels continue to be a driving factor in the growth of solar electricity. The average cost of a completed PV system is 16% less than the previous year. It now stands at $3.00/W. Texas’ cost of all PV systems is $5.83/W, which is 9th lowest in the country. In comparison, Ohio is the most expensive state in America, with an average cost of $10.09/W. In California, the nation’s leader in terms of capacity and total number of installs, the average cost is $7.08/W. Because of the enormous growth in manufacturing capacity in Asia, the average price of a solar panel has declined 60% since the beginning of 2011. These lower prices combined with a favorable regulatory environment and increased demand will likely mean more record growth in years to come. By the end of 2013, 4,300 MW of PV were forecasted to come online, a 27% growth over 2012.